Could brushless DC motors build themselves? All this talk about artificial intelligence, swarm technology and autonomous systems poses the question – Could a robot make itself? As reality often follows science fiction any fan of Terminator or Transformers has already thought about it, but what they may not realise is, …..it has already started. DC motors on Australias world record golf course. What do maxon DC motors have to do with Australian golf courses? Not just any golf course but the worlds longest golf course, the Nullarbor Links. Out of all the locations to play, this is one where a motorised golf caddy would come in handy. maxon motor supply quiet and powerful DC motors with efficiencies up to 90% to manufacturers of these caddies requiring the highest power density rare earth DC motors. To understand permanent magnet DC motors you must understand magnetics. Building the smallest most powerful DC permanent magnet motor requires deep knowledge of the fundamentals. maxon academy have compiled this know how and would like to share it. Everything from the historical discoveries and fundamentals through to superconductivity and even the Physiological effect of magnetic fields are covered. “I am sure you constantly wonder about the magnetic susceptibility of haemoglobin and biomagnetism”. “If not I am sure you can’t resist reading about cosmic magnetic fields”. The book magnetism by Dr Otto Stemme is truly comprehensive. Contact maxon motor Australia www.maxonmotor.com.au for a full understanding. Torque motors and DC servo motors for robotics applications. More and more often we see pancake or flat brushless DC motors replacing torque motors in low speed robotic joint and rotary stage applications. More than 50 brushless maxon drives are responsible for the humanoid’s precision movements. Roboy has a bright future, as he represents a completely new generation of robots. The pioneer project of the Artificial Intelligence Laboratory (AI Lab) of the University of Zurich started six months ago, with the target of developing one of the most modern humanoid robots within nine months. Now the robot has received a new face and is able to move his arms. On March 9, 2013, Roboy will be presented to the public at the “Robots on Tour” robotics exhibition held in Zurich on occasion of the 25th anniversary of the labSince the start of the project in the summer of 2012, Roboy’s development has progressed fast. The torso of the 1.30 m robot has been completed and assembled. The two arms are finished and can move; furthermore Roboy has now received a new face. 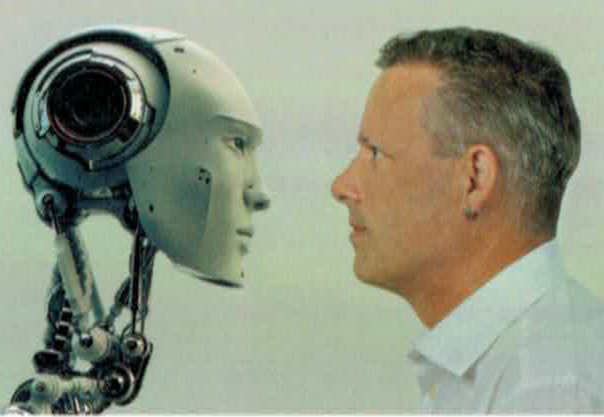 This friendly face is projected onto the head of the robot with a miniature projector and gives him a whole range of facial expressions. This makes his humanlike appearance almost perfect. Roboy will additionally be able to recognise faces that he has learned beforehand. The humanoid is a so-called “soft robot” – a further development of “Ecce”, his famous brother, which was also driven by maxon products. Roboy has been designed as a humanoid tendon-controlled robot (in “normal robots”, the motors are in the joints); this will enable him to move almost as elegantly as a human. Brushless DC motors for robot joints. Critical requirements for robotic motor drives are explained in detail by Dr Urs Kafader in the latest issue of Driven. The detailed publication from the leading manufacturer of DC motors. Power density, Multi pole motors, Brushless flat motors, Ironless DC gearmotors and many other important options are covered. From commercial to consumer robotics applications the highest efficiency and power density is becoming required from smaller and smaller motors. DC motors are his realm. But now he reveals his deep thoughts on Asimov, Artificial intelligence and the science fiction that disturbs him most. There is nothing artificial about this man’s intelligence. Contact maxon at www.maxonmotor.com.au for a copy of his insights. Fukushima – The DC motors and the man behind the rescue robot. Dr Eiji Koyanagi gives insights into robotics and the Fukushima disaster. 100% of the DC motors used in the quince rescue robots are supplied by maxon motor. See inside the reactor and inside the robot with the new maxon magazine application -driven- or go to www.maxonmotor.com.au and contact us for your free copy. How does a DC motor powered robotic snake achieve such lifelike motion? How are the DC motors controlled for slithering different directions? What is the longest snake arm ever built? Where are they used? OC Robotics co-founder Rob Buckingham answers these intriguing questions and more in the latest issue of driven. visit www.maxonmotor.com.au for a copy of the free magazine. The Boeing 787 dreamliner is fitted with maxon motors controlling valves with reliability. The dreamliner touch down at Farnborough with brushless DC maxon motors features in the new maxon magazine.